ALPINE BAKERY & PIZZERIA: Long Island native Bill Clementi and his partners, Stephen Bishop and Anthony DeTommaso, have the north side market cornered on Italian sweets. 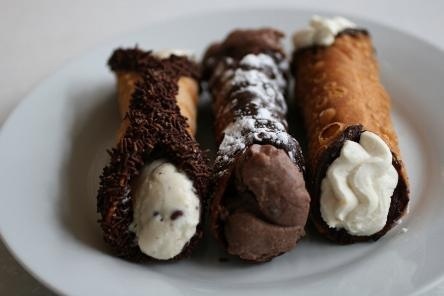 Their cannoli stand tall among the bakery’s offerings. The shells are freshly made and stuffed with a mixture of premium ricotta impastata, sugar, vanilla and a few secret ingredients. The filling is then studded with tiny chocolate chips. They’re offered in either small or regular sizes. 295 Rucker Road, Alpharetta. 770-410-9883. www.alpinebakeryandpizzeria.com. I love Vincent's on Barrett Parkway near Dallas Highway intersection.